Are you dreaming of a pure, elegant and convenient outdoor setting and of really enjoying a stunning view? Do you want to take full advantage of your Laurentians property in Tremblant, Sainte-Agathe, Saint-Sauveur or Saint-Donat? Would you like to fully enjoy waterfront living or have a better view of the nature reserve near your home in Mirabel, Blainville or Saint-Colomban? Do you plan to build, renovate or extend your porch, your indoor or outdoor staircase, or maybe your veranda, spa pavilion or pool fence? Would you like to expand your horizons, year after year? 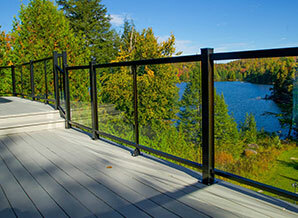 Thanks to our large top-of-the-line and guaranteed materials, which will require minimum maintenance (tempered glass–aluminum–wood–wrought iron), we allow you to complete your projects, to enhance your living environment and to increase your property’s value, whether it is residential or commercial, traditional or modern. Share your ideas with us Our team of experts will design plans that meet your needs, lifestyle and budget. These are really good investments: balconies, terraces, private access for disabled people, businesses or institutions. Say goodbye to painting, scraping, varnishing, scouring, and replacing boards or rotten bars every season. They are custom-made to separate your indoor and outdoor spaces, while following rigorous security standards, which we rigorously respect. They resist severe weather, sunlight, freezing and thawing, humidity, and even mould and mildew. 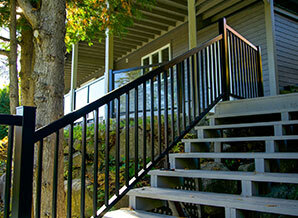 To build a stairway, components’ measurements must be extremely accurate and comply with strict security standards. Our products are made and distributed by our company or one of our suppliers, who are known for their innovative and high-quality products. The manufacturing and installation of aluminum stair stringers and stairways mean a well-thought-out investment, without any risk of rust for years. Our products are guaranteed. Is it now time to restore your patio or to build a new one? 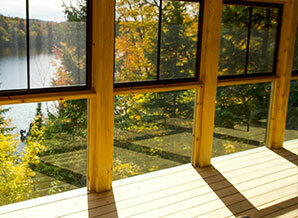 Trust our experts to make the best choice of materials, according to your lifestyle and to your home and yard design. Erecting a veranda means gaining a three-season living space at home. This construction has to meet strict specific standards: sturdy and durable, high-quality materials, harmonious style, choice of windows and window screens. Thanks to a patented and exclusive fenestration system, the veranda becomes a comfortable and airy room during all seasons. Patios and verandas are valuable extensions to the house. The choice of materials and colours has to be done in consideration of the main building’s architecture. Whatever your projects are, our team of experts will guide you through them by designing plans and completing indoor and outdoor work. 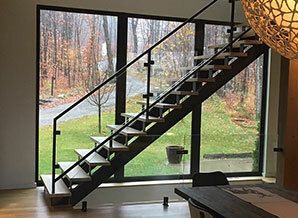 Our company Rampes et Balcons, in Saint-Sauveur, listens to your needs and offers you personalized services to guide your choices; they require little maintenance and make your life easier. Our products meet high standards for quality and durability. Our suppliers have been chosen to meet the needs of our clients, who have style, distinction and expect value for their money. We have been shooting for excellence since 2003.